UNILAG STUDENTS MADE MISTAKES DURING THE ULSU SAGA – FASA PRESIDENT. 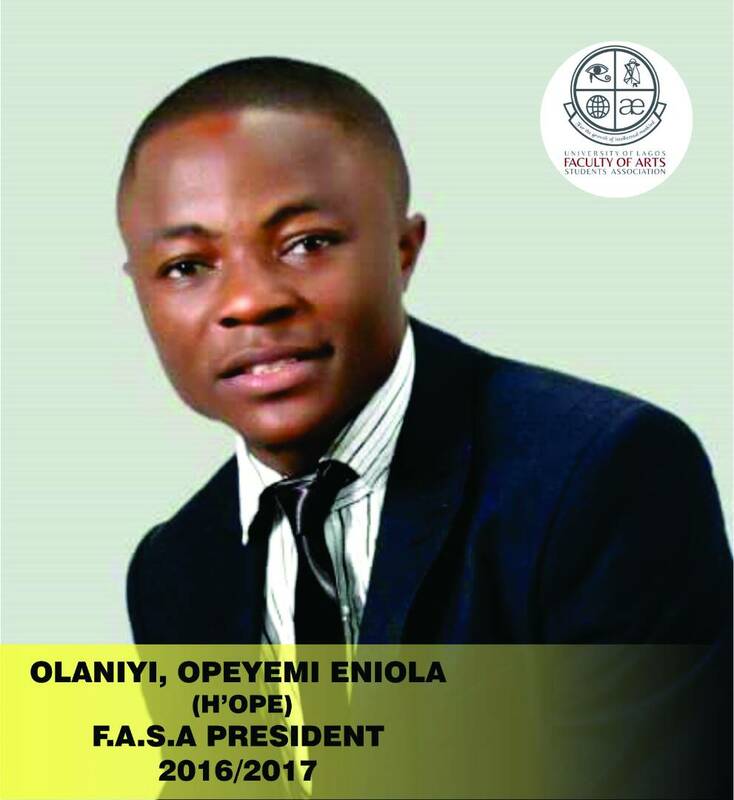 Olaniyi Opeyemi is the President of the Faculty of Arts Student Association (FASA), he doubles as the Chairman of the Council of Faculty Presidents. 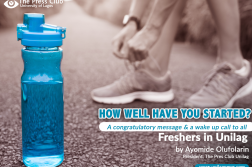 In this interview with UNILAG Press Club correspondents, Aisha Adebiyi and Daniel Adedoyin, he shed light on his background and his activities as a leader. My name is Olaniyi Opeyemi Eniola, a final year student from the department of English. I’m the president of the Faculty of Arts Student Association (FASA) and chairman of the Committee of Faculty President (COFP). I was born on October 12, 1992 at Agege to a family of six. I happen to be the last born, from Osun state. I come from a Christian background. I started my education at Christ International Nursery and Primary school before proceeding to Millenium Secondary School, Egbeda. Prior to your being elected as the president, what leadership positions have you held? I was the Welfare secretary for Faculty of Arts student Association (FASA), Financial Secretary Purple club, Purple club is a club that preaches gender balance. I’m also a member of UNILAG Press club. Coming to the University of Lagos (UNILAG), the University of First choice and Nations pride is one of the greatest achievements I have and also studying English from this prestigious Faculty. An event was shut down during the semester due to some irregularities. We are aware the faculty of arts was part of the organisers of that event. Can you shed light on what actually happened? The event was put to a stop due to some security issues. There was also the issue of the popular comedian ”Arole” that led to the stop of the event. It wasn’t canceled rather it was put to a stop after some hours. Leadership is full of ups and downs. Faculty of Arts Student Association (FASA) is filled with ideas. It is also a faculty of letters, we thought of Arts got Talent but due to financial challenges it was cancelled. Also, feedback has also been a challenge to my tenure.. This is because students fail to give feedback and this has been a problem. Sacrifice is one of the things that I have embraced. I have attended several leadership forums to equip myself. As the Chairman of the Council of Faculty President, how is your relationship with other presidents? There is a cordial relationship amongst all the faculty presidents. The level of closeness between us has helped a lot. We are aware that you represent students​ in some committees, can you tell us which of the committees and the role you have been playing? I represent the students in security issues in school. There is a committee headed by the Deputy Vice Chancellor (Management Services). We make sure students are secured and all. We have tried to improve the security system, we now have CCTV cameras. What is the Council of Faculty Presidents up to? Any plan on a unifying programme? The council of Faculty presidents partnered with the University to campaign against suicide. There is also the plan of organizing The Vice Chancellor’s Games as a sendoff programme for the Vice chancellor who is expected to finish his tenure by November. Is the Council of Faculty President doing anything about the restoration of ULSU? We (COFP) were close to ULSU excos. I personally was close to ULSU last year. Afolabi, a very good friend of mine was the General Secretary. I would have probably been on the rusticated list if I was a member of the executives. We did an evaluation as council of faculty presidents, we reviewed what happened to see what we did right or wrong and what we should have done. We COFP found out that we contravened some laws. That “we” every student of the University of Lagos made mistakes. We talk about the 3C’s of Aluta. (Consultation, Consolidation, and Confrontation). We didn’t really do much of that last year, if we didn’t do that, how else will we consolidate? 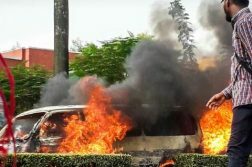 We keep misusing that word “confrontation”, when we hear the word, all that comes to mind is protest. My idea of leadership is having good negotiation skills and we have been doing that. What legacy do you want to be remembered for after your tenure? Being a president, friend, and a student leader that takes the interest of the student as his priority. That ”guy” that is concerned about his neighbor.